DC Comics have seemed to do something right with their digital first offerings. While DC's print line-up is always in flux, the digital line has been a model of consistency and quality. Injustice, DC Bombshells, Adventures of Supergirl, and The Legend of Wonder Woman have provided readers with some amazing stories. Issue two of Legend continues that winning streak with a dense and engaging read that sees Diana a little older, a little less green, and under Alcippe's wing. Renae De Liz has done an incredible job of making this coming-of-age origin story of one the most iconic figures in comics as enchanting and captivating as anything that's come before. Even as an adolescent, Wonder Woman has a curious mind, a strong will, and a protective nature. She's still learning to be a strong amazon despite the fact she could just rest on her princess credentials and simply await to be granted immortality as her mother Hippolyta suggests. It's a point of disagreement as Diana isn't even sure she wants immortality. Considering her mother made it her life goal to appease the gods and earn her chance of ever-lasting life it becomes a point of contention. Coupled with Diana's training with Alcippe, Diana still has a lot to learn. This print edition of the collected digital chapters encompasses a lot of information and moves plenty of plot points in a sharply written arc. There's still an uneasy dread of darkness hovering over the island that was established in the first issue but now more people share that feeling than just Diana and Alcippe. It's become such a worrisome issue that some on the council blame Hippolyta herself for bringing this darkness to Themyscira. The gods must not be pleased with her and thus, it lends to the political intrigue that could undermine Hippolyta's reign. The artwork from De Liz and Ray Dillon is some of the best you'll find in comics. De Liz's charming character designs have a slight manga influence with large expressive eyes that reveal a lot with few words. The lines are clean and there is never a wasted panel. We've never seen Themyscira as lush and expansive as we do in 'Legend.' It's a character unto itself full hidden mysteries and mystical charm. Dillon infuses all of this with a rich palette of color that is bold and vibrant, a fitting sheen to this paradise island. I'd recommend the book for the art alone but thankfully the story is just as good. 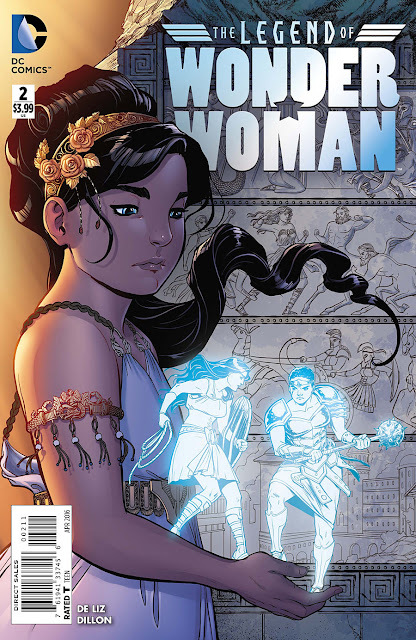 If you love Wonder Woman or want to fall in love with her all over again, then 'The Legend of Wonder Woman' is the book for you. A deserving retelling that demonstrates what made Diana the noble warrior of great character that she is with a compelling all-ages approach that works on every level. Buy the digital chapters, buy the print edition, just get your hands on it and savor what a great superhero comic should be.